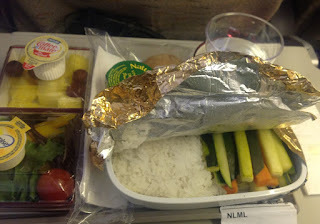 I had written earlier about the stellar meal I had onboard Asiana Airlines on a long trip between Korea and the US. Lest you think that the food was always good, the attention to detail exhibited by Asiana could also be its downfall. While checking in online, I noticed a number of options for "special meals" available to request, ranging from halal to gluten-free. I opted to request for a "lactose-free meal", not being particularly lactase persistent (like most folks). On a side note, in other airlines in the past, I've had reasonably good luck when requesting special meals - I usually end up with some good stuff not usually available. The chocolate chip cookie from a kosher meal still resonates in memory. 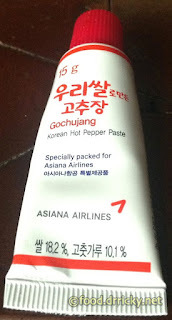 Alas, this was not to be on Asiana. The "lactose-free" meal on Asiana. Basically microwaved crudités and rice. The problem is that Asiana tries to bundle every dietary restriction into the meals. Lactose-free also meant gluten-free, meat-free - heck, near as I can tell, salt-free. In short, it tasted terrible. And the vaunted attention to detail came into effect when a ham and cheese sandwich was snatched away from me to be replaced by unadorned stale rice cakes. I tried to explain that all they had to do was remove the cheese from the sandwiches, but I made my bed and had to sleep in it. Lesson learned. But I found a compromise. My salvation: Asiana has these little tubes of gochujang - Korean hot chili paste - available, and provided a welcome respite from the burgeoning blandness of the meals.